Have you guys heard of General Store? I hadn’t until a week ago and since then, I’m hooked. I love their collection of simple yet interesting products. Mostly everything has a natural tone with varying textures, which I’ve been really gravitating towards lately. It’s hard not to get lost in their catalog! Here are some of my favorite picks from their website. 1. I love this leather camera strap, which is handcrafted and very minimal – in a good way. 2. This stapler is pretty spectacular. It may be the fact that it resembles a whale or that something so mundane has been turned into something so fun to look at. What do you think makes it so impressive? 3. Marble in the shape of a triangle – need I say more? 4. Here is another mundane tool – a bottle opener – that has been transformed into something interesting. I have no idea how it works, which makes me what to get it that much more. 5. I’m pretty sure if everyone owned this fountain pen, handwritten letters would be at their highest popularity since emails. I’m a pen and paper girl at heart but I’ve never actually used a fountain pen, have you? 7. This canvas tote comes in navy blue, black or white. I – obviously – love the navy blue paired with the beautiful handcrafted leather but the white and black are equally as eye-catching. 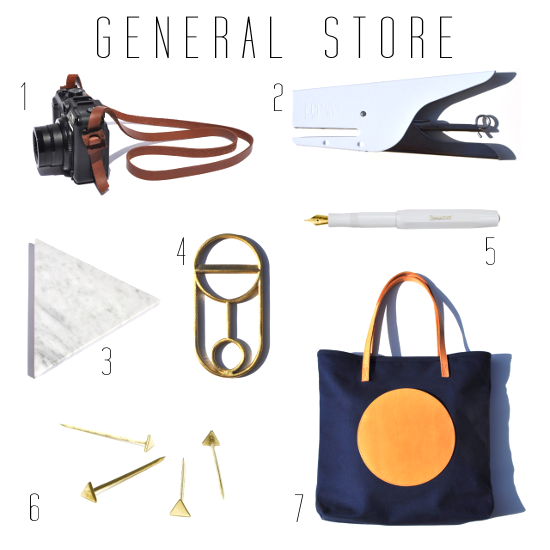 Have you taken a look around General Store? If I ever find myself back in San Francisco or Venice Beach, you can be sure their storefront will be on my “to-go” list.